Terror from Beyond the Daves would like to welcome guest writer, C.W. Prather, who has some exciting news regarding Virginia ‘s Karlos Borloff and his Monster Madhouse! 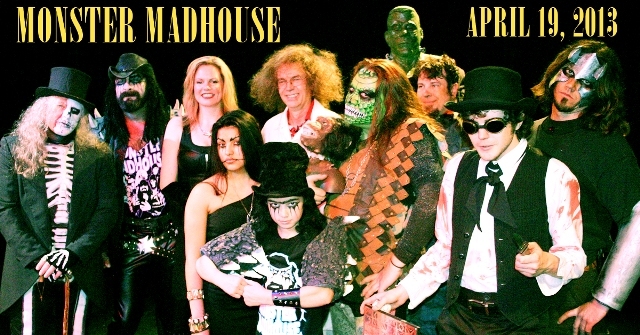 Northern Virginia’s “Monster Madhouse” with “Karlos Borloff “(Jerry Moore II) has been one of the more prolific DIY horror host programs in recent memory. Since its debut in 2006 rarely has there been a time when the show hasn’t been creating new content. From the more than 100 hours of live television, to the thirty minute “magazine” shows, to the one hour specials and edited two hour movie shows, there has always been a sense of creative urgency to feed whatever is next. Horror Host Mash Up: When East Meets West! BY BRIAN MAZE: In Fairfax, Virginia the PERFECT STORM of Horror Hosts converged to join together at The Monster Madhouse to host THE BEAST WITH 1,000 EYES! 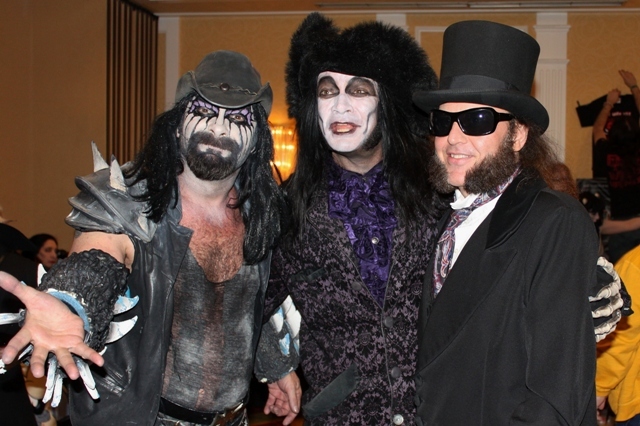 The Horror Hosts of Horrorhound Weekend 2011! Karlos Borloff, Dr. Destruction, & The Bone Jangler! DAVE F: If you attended the 2011 Indianapolis Horrorhound Weekend, with the intention of finding the many horror hosts in attendance, you should have had no trouble in doing so. Occupying their own room this year, most were together in a single spot (with the exception of Sammy Terry & Joe Bob Briggs). We had passed this section on our way to the celebrity rooms and noted a few familiar faces. As we entered, we immediately saw Roxsy Tyler, Midnite Mausoleum, and Dr. Calamari. Dr Calamari (easy to recognize as the guy with the tentacles coming out of his face) is part of a troop of performers called DARK CARNIVAL. 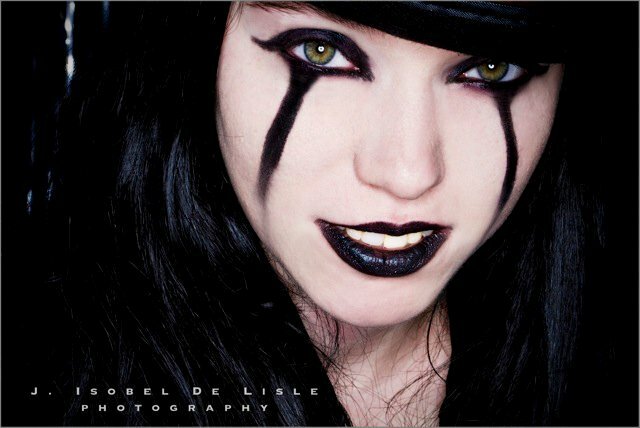 Roxsy Tyler, Midnite Mausoleum, & Monster Mania! The Daves would like to welcome and thank guest blogger Roxsy Tyler for this piece! The Monster Mania Convention in Cherry Hill, NJ takes place twice a year at the Crowne Plaza Hotel. There is one in March and always there’s another in August. Monster Mania also started popping up in Baltimore Maryland aswell. Monster Mania happens to be the first ever Horror convention I attended back in 2008 before I started running my Carnival of Horrors. 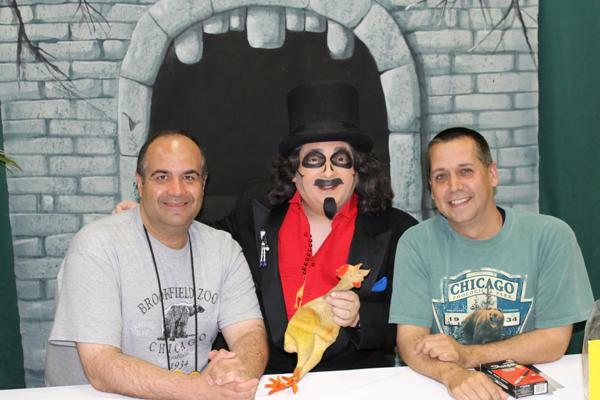 Easily, the convention became a place where every horror fan in the tri-state area could congregate, get dressed up, get photos with celebs, and meet their Facebook friends! In this amazing place where I met Adam West, Malcom McDowell, Sid Haig, Bill Moseley, and yes, even a fellow horror host by the name of Karlos Borloff… never did I ever imagine that someday people might come to get their picture taken with me. So, for those who didn’t have the opportunity to go to Monster Mania 17 here’s a recap for you where you can see it through the black drippy eyes of your favorite horror carnival proprietor.